Shakespeare writes a great present! Ang Lee's LIFE OF PI, which was the Opening Night selection for the 50th Anniversary New York Film Festival (NYFF 50) contains a great action/fantasy philosophical film, the story of a young man and a tiger adrift at sea alone, together on a lifeboat. For the story of the boy and the tiger, this film is entertaining... indeed, amazing and worth seeing. 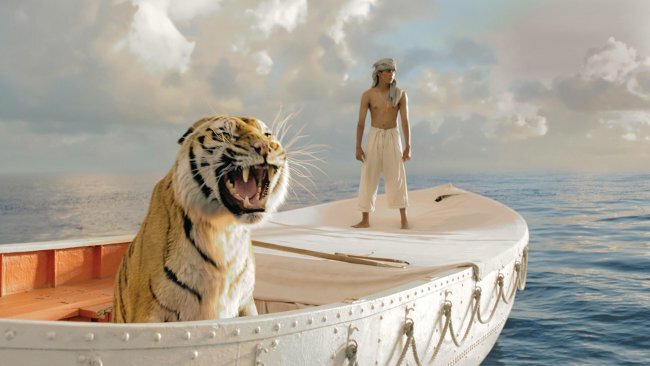 As a film, however, there is a problem...Ang Lee puts LIFE OF PI's central story, this great action/fantasy philosophical film, inside a frame that diminishes the brilliance of the conceit by saying too much and saying it unconvincingly. Alas! That's too bad. Because the inside, the story of the tiger and the man on the boat, is brilliantly conceived, brilliantly told, and brilliantly executed. The film is beautifully shot in a "gentle" 3D that enhances the image without calling attention to itself. It simply makes everything seem just a little more real. The Indian actor (Suraj Sharma, in his only film role) who plays Pi (the name is explained near the beginning of the film) is terrific. The (real!) tigers that play The Tiger are terrific (as are the digital effects that also contribute to The Tiger). The story of how the film was put together would be a great addition to the Blu-Ray disc or the Official Website. 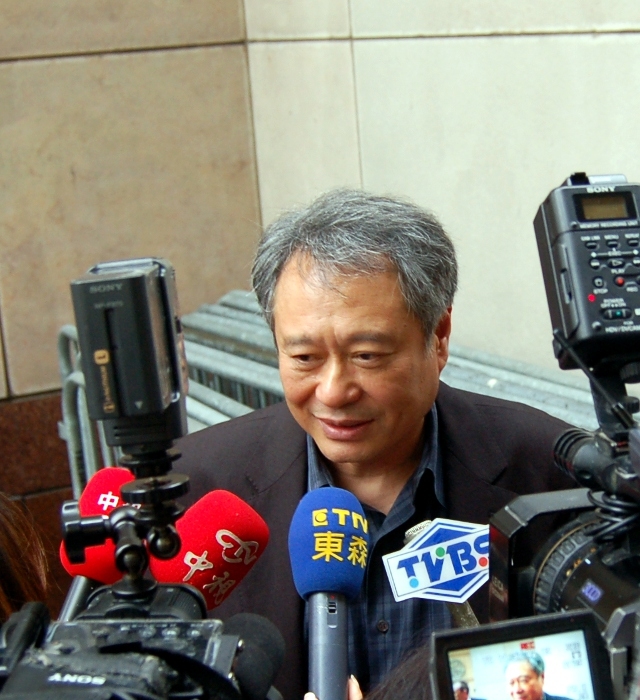 Ang Lee, the director has had quite an interesting career. His films range from Crouching Tiger Hidden Dragon, to Brokeback Mountain (for which he won the Oscar for Best Director), to Sense and Sensibility. Eat Drink Man Woman was perhaps the first film that brought him to the attention of the American critics. He was born in Taiwan about 58 years ago and went to college there, and then studied theater and film at The University of Illinois at Urbana-Champaign and NYU. This is a film I can highly recommend! Just (don't take the beginning too seriously, ignore the end, and) enjoy the middle! Irish actor Domhnall Gleeson and Swedish actress Alicia Vikander were honored this year as two of The Variety 10 Top Actors to Watch, and they were both at the Hamptons International Film Festival (HIFF 2012). Alicia with A ROYAL AFFAIR (an important film set in the 1700's about today's current politics), and Domhnall with SHADOW DANCER (a spy thriller). As it happens, the two actors already knew each other before they came to the Hamptons, since they were on-screen lovers in ANNA KARENINA. Here are some snapshots of Alicia and Domhnall from HIFF 2012. Both actors are rising stars with great careers! Some links to their work are listed below after the pix. She had just come in the night before from LA where she was filming a TV pilot about a young lawyer at an Innocence-Project type of organization, and leaving the next day on her way to Pennsylvania for some final shots to wrap the project, then off to Yale Rep where she is (CURRENTLY!) starring as MARIE ANTOINETTE in an interesting new play. And then there's another film in the works. It's exhausting just to write about it, yet she looked fresh in the Hamptons, and chipper again when I saw her at Yale. I spoke with Marin in a small space at HIFF where other interviews were also taking place, so it's just a bit too noisy, even after I softened some of the alien sounds, but I think Marin can be easily understood (though her voice sounds slightly tinnier than in life, since I had to filter out some of the bass to soften the voice of the guy talking behind me). Marin talks about the film, the play, and some of her thoughts about acting in films and theater. Marin has a phenomenal range: from films to theater; from experimental modern plays to Shakespeare. She is a very natural actress -- she seems to just make each character a part of herself -- or herself a part of each character. Her style (though not her appearance -- she is slight, not tall) reminds me strongly of Jill Clayburgh who also excelled at inhabiting her roles with a versatile naturalness and intense inner life. SPARROWS DANCE is a sensitive film about an agoraphobic young woman. She won't leave her apartment, but when her toilet overflows the world's nicest plumber comes to fix it. It's a small-scale, low budget, indie film... a very very good one and it leaves you with a satisfied feeling that you have understood something about the characters, about life and about love. 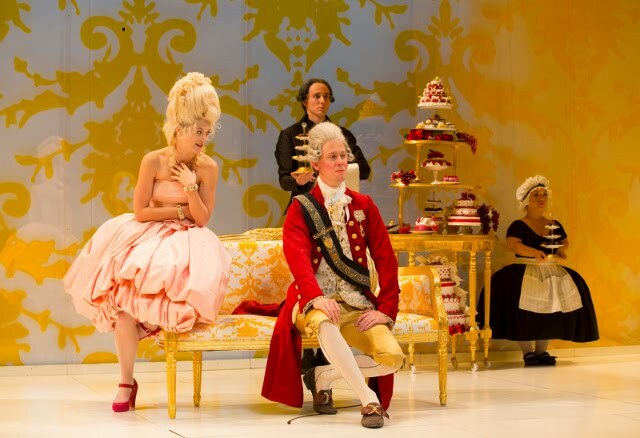 While SPARROWS DANCE is very simple and naturalistic -- albeit about a problem that is extra-ordinary enough to be interesting, MARIE ANTOINETTE, a new play at the Yale Rep is mannered in the extreme, about a Court that was mannered in the extreme. In this production Marie appears at age 21 or so, with a valley girl accent, fashion obsessed. The opening tableau in fact is so original and spectacular it draws immediate applause. It's not completely clear whether this accent is the creative team's specific impression/translation into English of young, somewhat ignorant, self-centered, light-headed Marie Antoinette’s poor Austrian accented French; or just a way of conveying a light-headed immature woman out of her depth. Actually I don't think the production was aiming for historically detailed accuracy. So this is more of a generic Marie Antoinette in a story about discovering responsibility too late, and (since a major part of the story is The King, who's not up to the task) how a Kingdom can be lost for want of a King -- at least a King who can make the right decisions in a tough military and financial situation. It is probably not a coincidence that this play was in fact written during the Bush years. On the one hand, this play reminds me of CLOUD ATLAS, which in part deals with the relation between the leaders and the population; and even the BACCHAE, which (at least for me) is the story of a revolution by the subjects -- who consider themselves the real gods -- over a repressive regime; and, on the other hand, the recent A ROYAL AFFAIR which also deals with a similar period and a similar situation: a young woman trucked in (or carriaged in) across Europe in the mid 1700's, to marry a difficult and immature King, and the politics of governing. 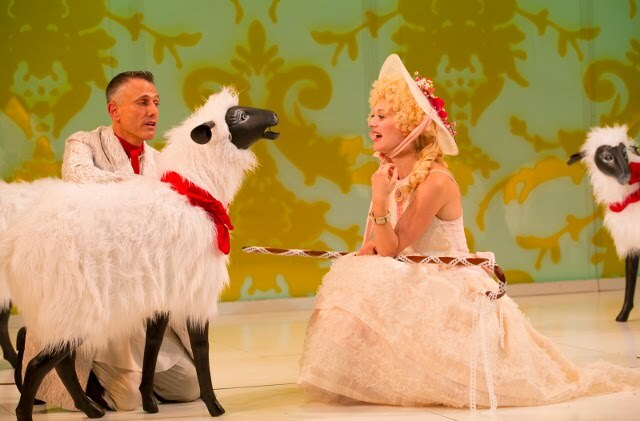 At one point, Marie begins talking to a sheep (played by David Greenspan with a puppet/sheep-dummy). It is deliberately ambiguous -- the sheep could be an external metaphor for Marie's thoughts, or for the "polis" as in a Greek Chorus, or the playwright's voice, or absurdist theater, or an extra character that was needed when no human was available... or some combination of these... changing from scene to scene. These scenes were developed and experimented with extensively in rehearsal until they "worked". Even if we are not sure what The Sheep means, we do believe that The Sheep knows what he means, and so we can accept him. Sofia Coppola and Kirsten Dunst had a much more sophisticated Marie. Yes, she arrived as a young girl, but she had more depth, and the debacle was less the result of royal incompetence in Sofia's film -- which was something of an "apologia" for Marie Antoinette -- than in Adjani's story, which was more of a condemnation of royal incompetence. Marin fully embraced the vacant Marie Antoinette at the beginning and the desperate Marie at the end; both completely different from the self-inflicted blockage that characterized the agoraphobia in SPARROWS DANCE. All different, yet all Marin. This Marie Antoinette was produced in cooperation with Diane Paulus' A. R. T. in Cambridge Mass, where there was an earlier production of Marie Antoinette with another lead actress. Yale Rep is quite a wonderful place for interesting theater. It's only 90 minutes from NYC and worth the trip. Anne Hathaway is a big star. She's a great singer and both a comic and serious actress. She is best known both for films from pre-teen fairytale fantasies like THE PRINCESS DIARIES to THE DEVIL WEARS PRADA and LOVE AND OTHER DRUGS. Most recently in THE DARK KNIGHT RISES, and coming soon in LES MISERABLES. RIHANNA is a top pop singer. COLD OPEN - Romney after the election results... not very funny, insightful or touching. Not really lame. Just kind of benign. MONOLOG - A Les Miz thing with not great lyrics. GIRLFRIENDS TALK SHOW – Co-hosts – One now has a new best friend. They bicker. Not pleasant. Not funny. Not interesting. VIDEO – Green glop & a stupid dance (they said it, not just me). One dance video went viral. I guess they’re thinking, “Why not another?” Supposed to be hypnotic. Nope. HOMELAND – A sharp parody with many funny moments. MCDONALDS – Layoffs. More insults. “Andrew” made a funny face. This sketch was unpleasant and just awful. Who wrote this? Or let it get aired? WEEKEND UPDATE – One good Petraeus joke. ELLEN - Another lame sketch. The sketches were so bad, the commercials were a relief. Baileys Cream ad was a winner. Some film and game previews were good. But the Surface ad is pointless and derivative, dumb and meaningless. MUSEUM: AMERICAN GOTHIC – This was a great concept, showing how the pose developed, but the writing did not rise to the opportunity. Note: Anne Hathaway does a great cross-eyed. RIHANNA’S first song had a nice greenscreen/backdrop look, and the second song was terrific. Interesting song; and the lighting and staging was perfection. One of the best song performances on SNL ever. The fake ad for the fake medicine, FLARITIN, for fake allergies was amusing. NJ Voters displaced by Sandy should be able to vote by e-mail. The procedure, as I understand it, is to contact your County Clerk by phone or e-mail, receive a ballot, and e-mail it back by 8 PM tonight. If the County Clerk does not respond in a timely fashion this procedure would be a sham. Here is some contact information for the County Clerks. Note that you may need to look up the e-mail address by going to the website of the county clerk. click on the website there for your County Clerk and find their e-mail address on the website contact information. Good Luck! This is an important election! Mr. Robert J. De Mers, Jr.